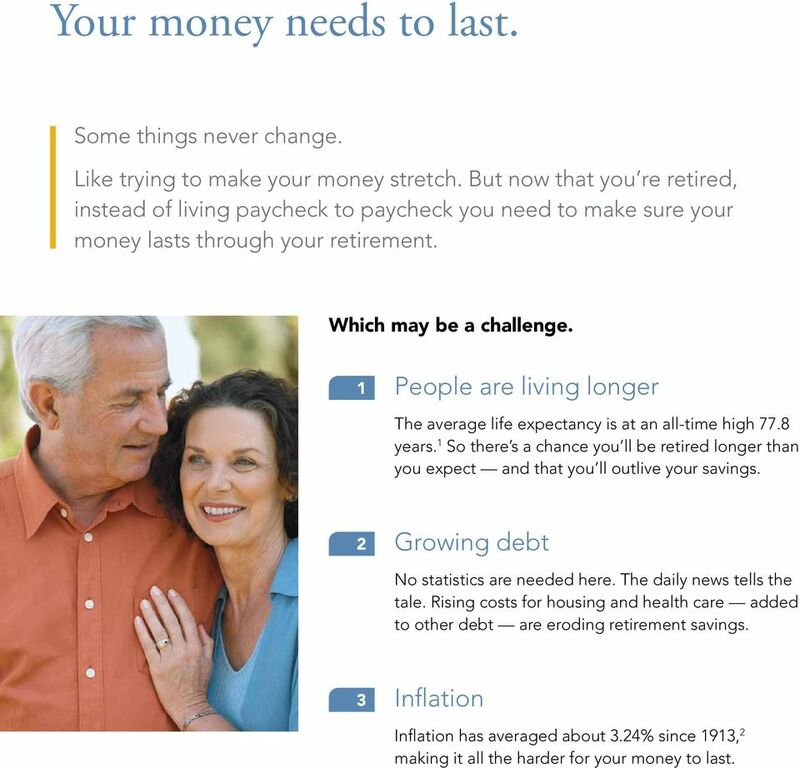 Download "Make your money last through your retirement"
2 Why purchase an income annuity? It s a convenient way to provide guaranteed retirement income on a schedule that works best for you. 3 Your money needs to last. Some things never change. Like trying to make your money stretch. But now that you re retired, instead of living paycheck to paycheck you need to make sure your money lasts through your retirement. Which may be a challenge. 1 People are living longer The average life expectancy is at an all-time high 77.8 years. 1 So there s a chance you ll be retired longer than you expect and that you ll outlive your savings. 2 Growing debt No statistics are needed here. The daily news tells the tale. Rising costs for housing and health care added to other debt are eroding retirement savings. 3 Inflation Inflation has averaged about 3.24% since 1913, 2 making it all the harder for your money to last. 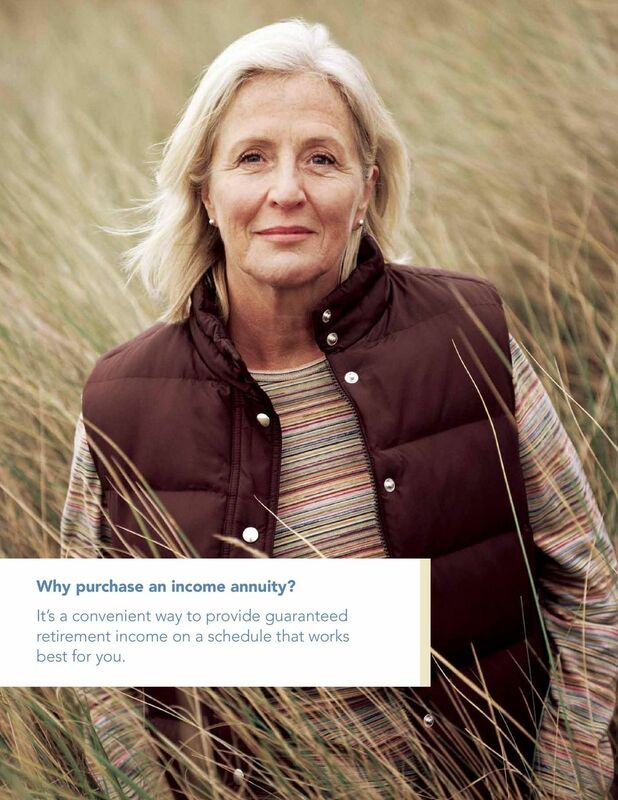 4 Why choose Symetra Advantage Income Im How an income annuity can help. Maintaining your current lifestyle during retirement may cost more than you think possibly as much as 94% of the income you earned while working. 3 So how can you make sure you ll have enough? Cover basic expenses You can use income from the annuity for daily expenses giving you the peace of mind that they re covered no matter how long you live. Add stability to your portfolio It s guaranteed income on terms that work best for you. Manage your income tax You can limit your income tax burden by spreading it out over time. Consult your attorney or tax advisor for more information. Roll in other assets * You can roll some or all of your retirement plan assets into your income annuity turning those assets into steady income. * Consult your attorney or tax advisor on any potential tax consequences before taking money from your other assets. 5 mediate Annuity? 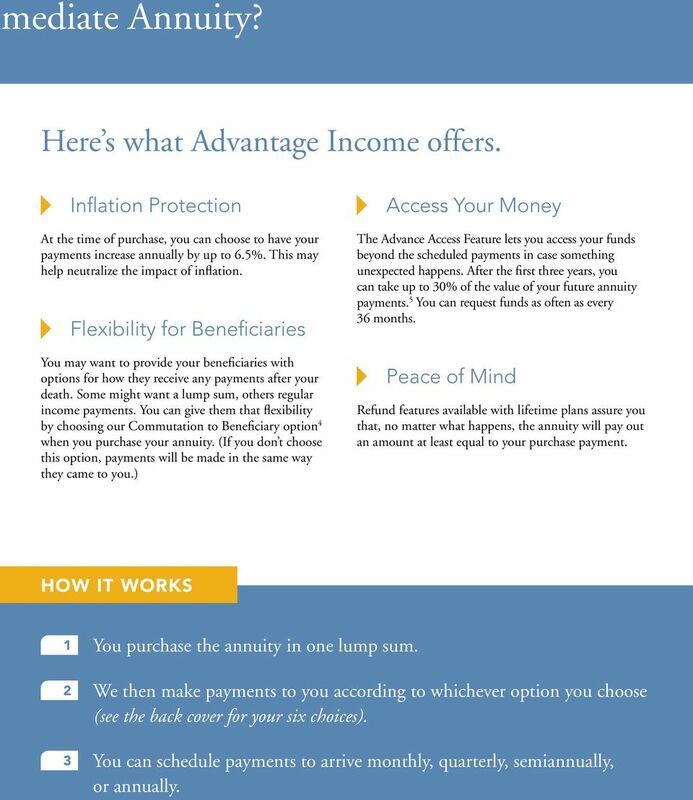 Here s what Advantage Income offers. Inflation Protection At the time of purchase, you can choose to have your payments increase annually by up to 6.5%. This may help neutralize the impact of inflation. Flexibility for Beneficiaries You may want to provide your beneficiaries with options for how they receive any payments after your death. Some might want a lump sum, others regular income payments. You can give them that flexibility by choosing our Commutation to Beneficiary option 4 when you purchase your annuity. (If you don t choose this option, payments will be made in the same way they came to you.) Access Your Money The Advance Access Feature lets you access your funds beyond the scheduled payments in case something unexpected happens. After the first three years, you can take up to 30% of the value of your future annuity payments. 5 You can request funds as often as every 36 months. Peace of Mind Refund features available with lifetime plans assure you that, no matter what happens, the annuity will pay out an amount at least equal to your purchase payment. 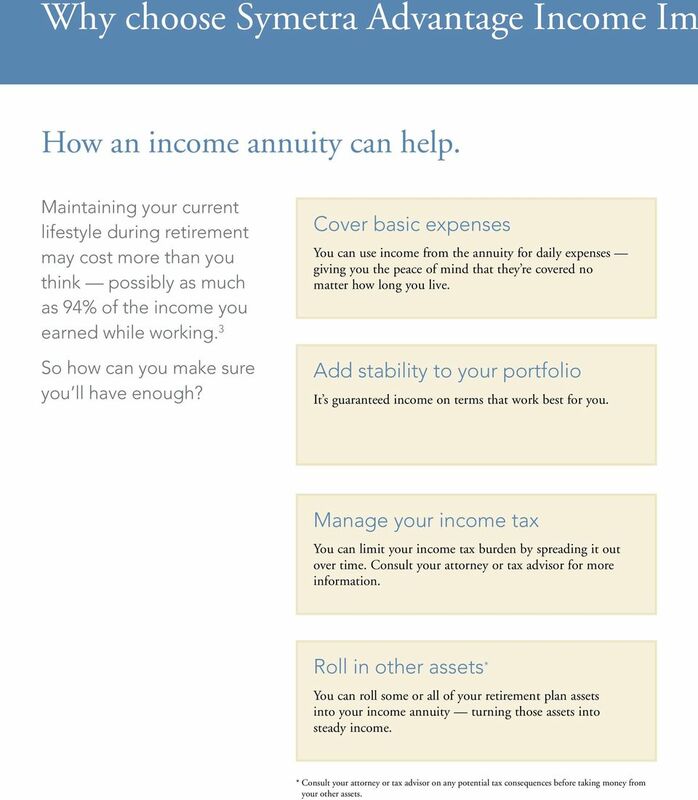 how it works 1 You purchase the annuity in one lump sum. 2 We then make payments to you according to whichever option you choose (see the back cover for your six choices). 3 You can schedule payments to arrive monthly, quarterly, semiannually, or annually. 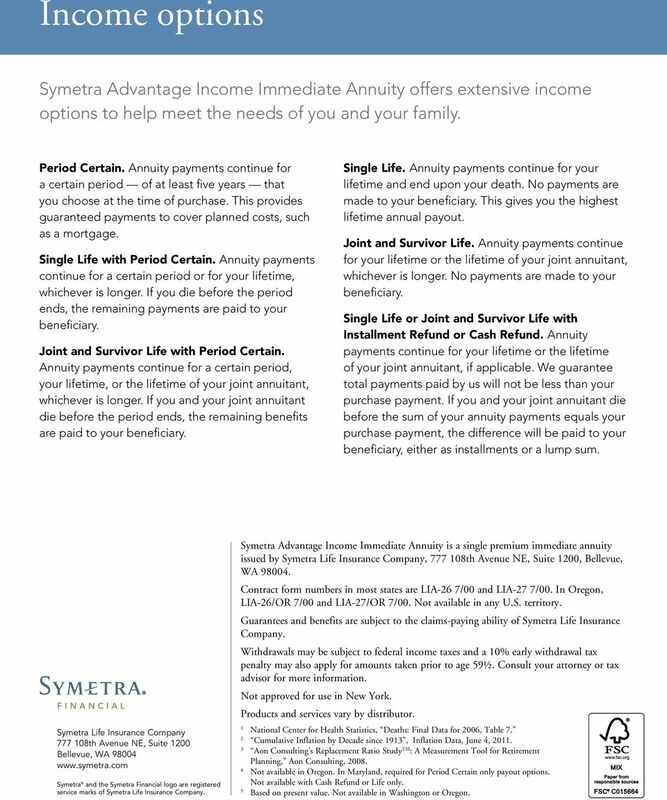 6 Income options Symetra Advantage Income Immediate Annuity offers extensive income options to help meet the needs of you and your family. Period Certain. Annuity payments continue for a certain period of at least five years that you choose at the time of purchase. This provides guaranteed payments to cover planned costs, such as a mortgage. Single Life with Period Certain. Annuity payments continue for a certain period or for your lifetime, whichever is longer. If you die before the period ends, the remaining payments are paid to your beneficiary. Joint and Survivor Life with Period Certain. Annuity payments continue for a certain period, your lifetime, or the lifetime of your joint annuitant, whichever is longer. If you and your joint annuitant die before the period ends, the remaining benefits are paid to your beneficiary. Single Life. Annuity payments continue for your lifetime and end upon your death. No payments are made to your beneficiary. This gives you the highest lifetime annual payout. Joint and Survivor Life. Annuity payments continue for your lifetime or the lifetime of your joint annuitant, whichever is longer. No payments are made to your beneficiary. Single Life or Joint and Survivor Life with Installment Refund or Cash Refund. Annuity payments continue for your lifetime or the lifetime of your joint annuitant, if applicable. We guarantee total payments paid by us will not be less than your purchase payment. If you and your joint annuitant die before the sum of your annuity payments equals your purchase payment, the difference will be paid to your beneficiary, either as installments or a lump sum. Symetra Life Insurance Company th Avenue NE, Suite 1200 Bellevue, WA Symetra and the Symetra Financial logo are registered service marks of Symetra Life Insurance Company. 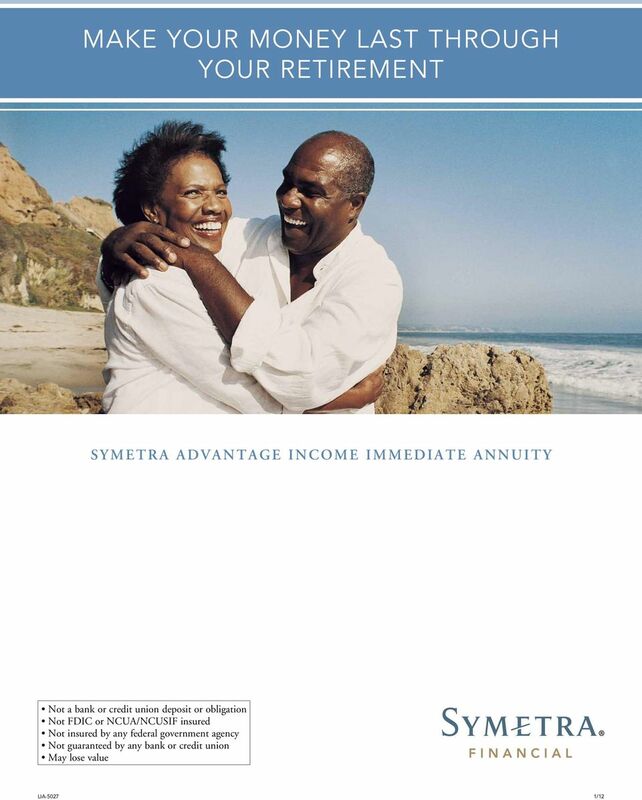 Symetra Advantage Income Immediate Annuity is a single premium immediate annuity issued by Symetra Life Insurance Company, th Avenue NE, Suite 1200, Bellevue, WA Contract form numbers in most states are LIA-26 7/00 and LIA-27 7/00. In Oregon, LIA-26/OR 7/00 and LIA-27/OR 7/00. Not available in any U.S. territory. Guarantees and benefits are subject to the claims-paying ability of Symetra Life Insurance Company. Withdrawals may be subject to federal income taxes and a 10% early withdrawal tax penalty may also apply for amounts taken prior to age 59½. Consult your attorney or tax advisor for more information. Not approved for use in New York. Products and services vary by distributor. 1 National Center for Health Statistics, Deaths: Final Data for 2006, Table 7. 2 Cumulative Inflation by Decade since 1913, Inflation Data, June 4, Aon Consulting s Replacement Ratio Study TM : A Measurement Tool for Retirement Planning, Aon Consulting, Not available in Oregon. In Maryland, required for Period Certain only payout options. Not available with Cash Refund or Life only. 5 Based on present value. Not available in Washington or Oregon. Redefine your means in retirement. So you can do more of what matters. Redefine your means in retirement. So you can do more of what matters. More guaranteed income to count on when you need it to count. It s taking that second vacation instead of giving it a second thought. for life A predictable monthly income stream. Option to choose an income that s guaranteed to last a lifetime.